Yup! 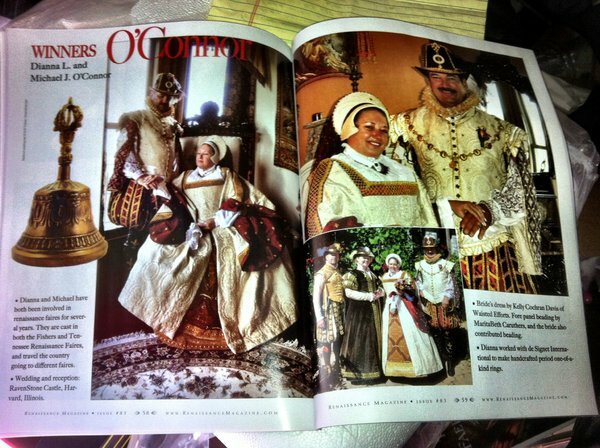 The O'Connors are one of three winners in the Renaissance Magazines Wedding Photo Contest. How awesome is that? They look just marvelous. Selfishly, my favorite picture is the one with the Barkers and the O'Connors together. Lots of Waisted Efforts goodness all in one. :-) Congratulations, O'Connors! On a DPP 2012 note; I did not enter this year. I just had too many things get in the way for me to meet the deadline. I am super excited to see the entries tomorrow! I am still making the dress for Deeanne, and will soon have pictures up to prove it. -grin- The fabrics are SO incredibly awesome. Still trying to decide what hat to make. There are several choices, and so many neato ways to go. Look back soon for those updates. Till then goodluck to all the entrants in the DPP this year. May the bestest dress and underwear bits win!